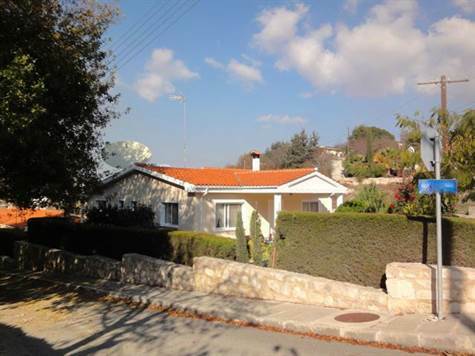 Tsada, Paphos - This charming 2 bedroom bungalow is situated on a large corner plot in a quiet residential area of the traditional Cypriot village Tsada. The local amenities such as coffee shops, bank and tavernas are within easy walking distance and one of the area’s superb 18 hole championship golf courses is a few minute's drive away. The property features a spacious and comfortable living room with central feature fireplace and log burning stove. An attractive stone framed archway leads to a formal dining area and impressive well equipped kitchen with central island, American style fridge/freezer, fitted oven, gas hob, cooker hood, dishwasher, washing machine and built-in wine rack. Patio doors lead from both the dining area and kitchen to a wide covered terrace with lovely rural views overlooking the swimming pool terrace below. The bedrooms are spacious with fitted wardrobes providing plenty of storage space. The master has direct access to the outside terrace via patio windows and a modern en-suite shower room. A good size family bathroom is accessed directly from the hallway. The gardens are beautifully landscaped and the property has it’s own well which the vendors use to top up the swimming pool and for irrigating the wide variety of shrubs and trees. The property has been designed with wheelchair use in mind and is ideal as a permanent residence or holiday home. It is in excellent condition with quality finishes throughout.